Do you have questions or doubts about the Christian faith? Come and find answers! We will be hosting an open forum for you to ask your questions and seek answers in a safe, non-judgmental atmosphere. All students are welcome to come and ask question about Christianity, the Bible and Faith. Questions can be anonymous, and we will attempt to answer all questions that are asked with sincerity. Do you have any doubts or questions about the Christian faith? 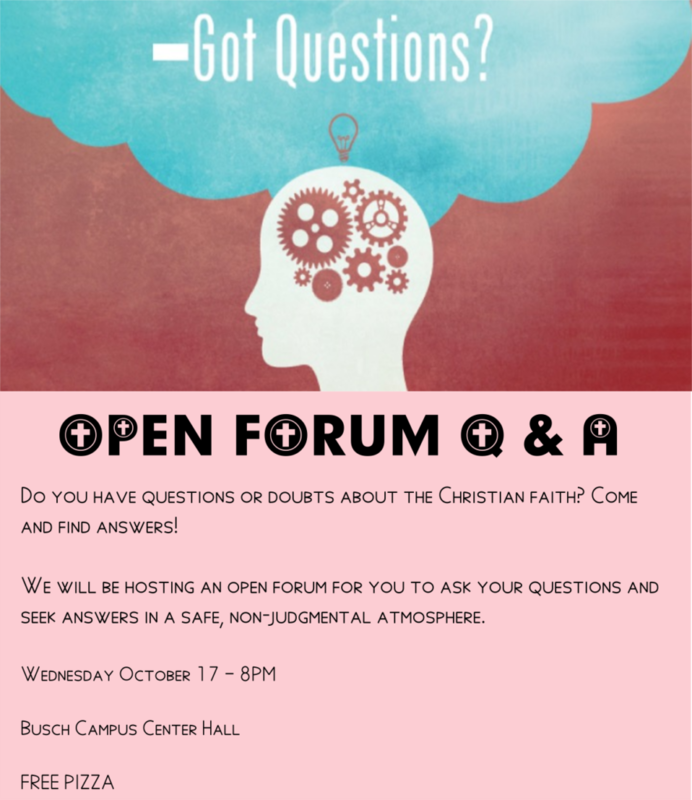 We are hosting an open Q&A event with a panel from Ratio Christi intended for students who have questions regarding Christianity. This event is open to all students. This will be a safe place to bring doubts and objections that have gone unanswered. We are focused on having thoughtful discussions about the things that really matter.